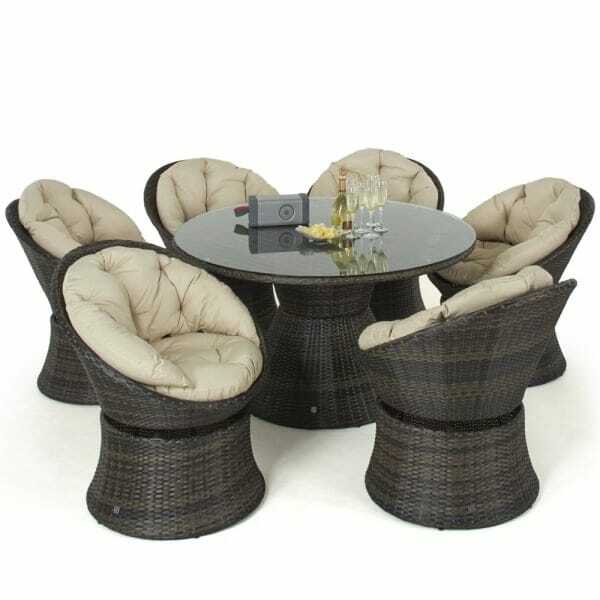 Maze Rattan 6 Seat Swivel Dining Set: This 6 person swivel dining set is the perfect place to relax for a spot of alfresco dining. The swivel chairs are comfortable and include seat and back cushions which are padded for maximum luxury. The swivel design of the chairs will give you the opportunity to get some stunning views of your garden and also to socialise better with those dining around you. The chairs and table all have a rust free aluminium frame to them and the synthetic rattan is available in both grey and brown with matching cushions to compliment the look of the set. The generous 135cm table has plenty of space for all 6 diners and features a tempered glass surface for safety and ease of cleaning. This Maze Rattan garden furniture comes complete with a 5 year manufacturer’s guarantee. This set will be delivered to you flat packed for easy self-assembly.